RGBLink VSP 3500 has been out of production. You can buy its updagraded version: Venus X2. The VSP 3500 is a dedicated, seamless video wall processor with additional features that make setup easier, allow for multiple display windows, and provide DSK and rotary capability. 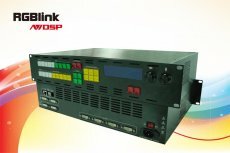 The VSP 3600 can be used for seamless switching and scaling applications. It can display multiple display windows with DSK effects and rotary options, when basic video wall control is not required. The VSP 3500 can be controlled via the front panel, Windows Control Panel or the optional remote control panel CP 2048.